Chibi Angel X is a hard hitting Bad Girl Comic at it's screaming heart yet not afraid to poke fun at itself while tearing down the neighborhood. I an age of Biog Screen Hollywood comic book movies, Chibi is NOBOBY'S role model. She's cocky, rude and an all out killer on wheels. My new comic is as much a tribute to the great comics and manga of the past as it is a parody of itself. 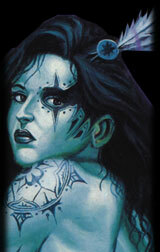 Based on the cult comic book series BABY ANGEL X from the infamous "Bad Girl" era of the nineties Comic Book culture. CHIBI ANGEL X is not so much of a reboot of the original as it is a satirical retelling in a much stranger universe. If you like red hot gun metal and devastating mystical attacks then sterp right up and prepare to have your face melted. So please join me and jump on the ground floor and I promise you won't be sorry. Many late nights and wee hours have been burned in order to craft the strange tale you are about to embark on. I invite you to look beyond the leather bikini and find the hero in my story. So please have a look around and remeber to always keep your eyes and your mind wide open! Also keep in mind that I am available for comissions, the easiest way to contact me is through the Chibi Angel X-Badder Days ahead Facebook Page. Look for the link below and please consider signing up for my email list for updates on new creative projects and events. I hope you enjoy your visit here and feel free to leave me your comments. The stories contained on this web site are works of fiction. ATOMIC TADPOLE, BABY ANGEL X, SWEET LUCY, TECHNOPHELIA and CHIBI ANGEL X and all related characters featured on this web site and the distinct likeness thereof are © Copyright 2009, Scott Harrison. Nothing may be reproduced in whole or in part for commercial sale, without written permission of Scott Harrison. Portions of these works may be used for journalistic purposes with the permission of Scott Harrison.